It doesn’t take long to learn to play a few basic chords on the ukulele and join an uke club to strum, sing, and socialize. No other instrument allows the beginner to practice playing in the relaxed company of others and travel the world with it. As an ukulele enthusiast, I consider the existence of so-called ukulele clubs a golden perk of playing the ukulele. I don’t know of any clubs for other instrumentalists that welcome beginners to jam with more advanced players. Perhaps barbershop quartets or multi-instrumental jam sessions may allow for that, but how common are they really? The ukulele clubs’ tradition of group playing is a fun way to push myself to learn new chords and expand my repertoire. I can’t think of a better way to combine practice with socialization. When I started learning to play the ukulele, I had no idea there was one right on Maui about half-an-hour’s drive from my home. These clubs meet regularly and welcome newcomers to join a session. Apparently such ukulele groups exist all over the world. Established ukulele websites, like Flea Market Ukulele and Got A Ukulele, update their directories of uke clubs by continent and country. You only have to know a few of the most common chords, namely C, F, and G7, to play and sing together. This means that you can be a complete beginner and still fit right in. The club usually has its own song books or song sheets that you can borrow, buy, view from an overhead projector or available for download. You don’t need to commit to attending every week for any period. You can just show up, though some clubs request that you indicate your attendance due to space constraints. Every club has its own traditions. On Maui, 808 Uke Jam calls their Thursday evening meetings “class and jam session” and provides three songbooks and music stands on loan. The participants meet barefoot in a wooden church next to the beach, and hula dancers dance to the Hawaiian songs they play. The leader has a strong voice, joined by other instrumentalists who play slack key guitar, bass guitar, and other ukuleles. Tourists are a common sight among the regulars. I managed to squeeze in three sessions before I left the island last June. The Ukulele Union of Boston uses the MeetUp.com website and associated app to announce the various jam sessions in Greater Boston. I’ve attended the Wednesday evening meet-up at the Potbelly Sandwich Shop next to Porter Square T-Station as well as the 1st and 3rd Thursday evening session in a photo gallery in South End. There are others I plan to visit in the future as none are near my flat in Boston. The tradition is an hour of playing and singing together from songbooks available for download or print, a break, and open mic in the second half where individuals or groups can volunteer to perform while everyone listens. In the UK, I was thrilled to discover an active scene on different evenings of the week in different parts of London. The Hanwell Ukulele Club (HUG) meets every Tuesday at the Viaduct Pub on Uxbridge Road across from Boston Manor Road, a mere thirty-minute walk from my home. The two founders Geoff and Rick use an overhead projector to navigate song sheets that they and other members meticulously compile for consistency and accuracy, all available from their dropbox which they freely share on their Facebook Page. On my first visit in late January, I learned that they had a gig the next evening in the George and Dragon, a historic pub with its own microbrewery in nearby Acton. Needless to say, I quickly bonded with members of the group, mostly laid-back English gentlemen who were curious how I suddenly appeared out of nowhere, carrying a shiny tenor ukulele never seen in this part of the world and tempting them with exotic tales of tropical paradise. Their summer diary is full of exciting performances such as a float (parade) in the annual Hanwell Carnival and gigs at the Ealing Beer Festival. One industrious lady organized a coach trip to a beach, and another is hosting a street party in her neighbourhood. As a pianist, I’m suddenly empowered with a light and portable instrument that I can carry and make music with local communities. Instead of reserving hotels with pianos, staying with friends with pianos, or visiting music conservatories with pianos, I now carry my Tiny Tenor or XS Soprano and seek out ukulele clubs everywhere I go. 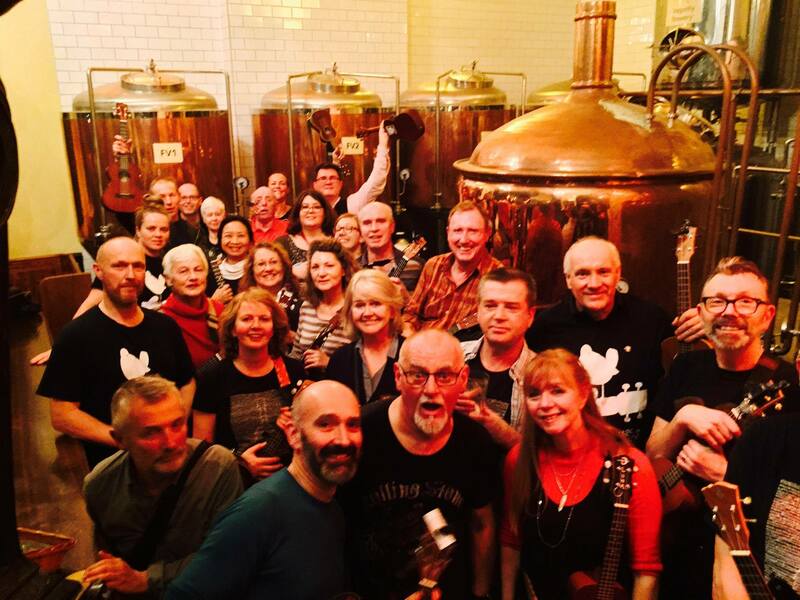 Next Tuesday 13th June evening, the Hanwell Ukulele Club celebrates its fourth anniversary at the King’s Arms Pub in London Hanwell. I am eager to find out how the founders managed to grow the club to 340 members on its Facebook Page and generate an active gig calendar.